How Can Businesses Deliver Videos Into China Reliably? For many businesses that create and publish video content, China remains a market beyond their reach. It seems almost hard to believe that the majority of video platforms are still not able to stream content to Chinese audiences from within the People’s Republic of China (PRC) itself. But this is changing. 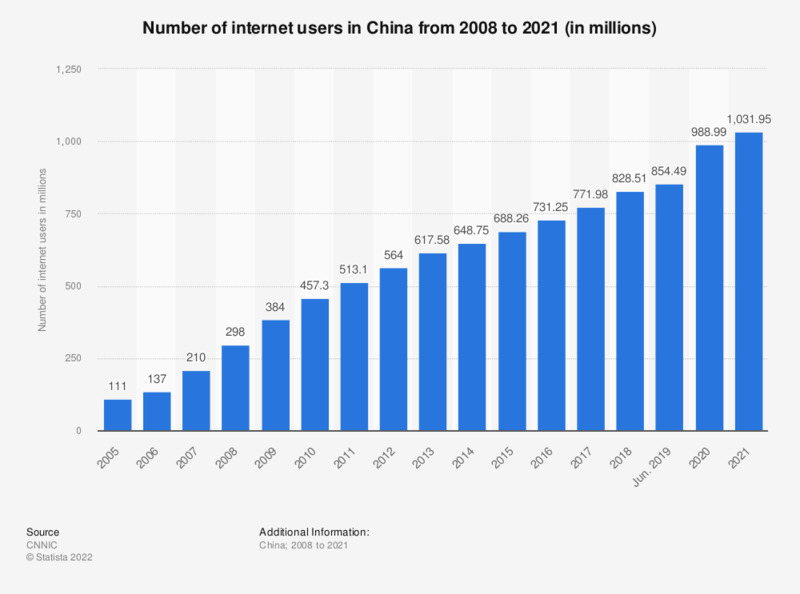 Over the past ten years, the number of people accessing the Internet in China has increased 5x. However only 48% of the population has access to it which is due to the patchy and inconsistent availability of Internet across the country. As expected, such strong growth has led to an explosion of online video platforms in China. In 2007 a mere 160 million Chinese had watched videos online. By 2014 this number was 3x, reaching nearly 433 million viewers. The overall size of China’s online video market in revenue amounts to 33 billion yuan. With those stats as benchmarks, that the internet has become the preferred platform in China for watching video content. This is especially the case for younger generations. According to the CNNIC, more than half of online video viewers in China are in their teens and 20s. It’s these amazing stats that have fuelled the rampant development in social video services in China. More often than not video hosting platform sites are restricted from operating in China due to the famous ‘Great Firewall’. This is a term used to describe China’s internet censorship system that blocks a large number of international websites, apps, social media and other online resources deemed inappropriate or offensive by authorities. This system employs around 2 million individuals in China to censor content on the Internet. All external video content sent into China is heavily monitored to ensure it complies with their strict rules. When Winnie the Pooh was used to mock the Chinese president Xi Jinping, the Chinese authorities took action. They banned the release of Christopher Robin – a film based on the popular character. Many organisations find that when Content Delivery Networks (CDN) stream video to China from outside the Mainland, the speed and quality are variable and inconsistent. This invariably impacts their branding and the value of the service they are offering. CDN points of presence (or PoPs) reduce loading and buffering by caching content at the server closest to the viewer. This ensures that, wherever viewers are in the world, they have videos delivered from a server near them. For a Chinese viewer, if the content is streamed from as far away as Seattle (that’s not uncommon) the degradation of speed and latency is plain to see. Think of latency as simply being how long it takes to ask for a piece of data and receive it back. The further you are from the server, the more intermediary points the request and the response have to go through, in order to get from A to B. No matter how fast your ISP advertises your connection as being, latency can still cause major playback delays, particularly when viewing HS content. Naturally, when you’re delivering video, that’s hugely important. If it takes a second or more to make a request and receive a response, the likelihood is that your viewers aren’t having a great experience. By using a CDN POP in China, vzaar can ensure that latency is much lower than other video hosting providers. We can also guarantee your videos will be playable and not blocked by the Great Firewall. At vzaar, a use case we see more and more is companies wanting to deliver employee or agent training to their operations in China. We’ve also seen an increasing number of companies wanting to use video to market to consumers in China. For a high-end vacations business, it was vital that prospective customers in China had the highest possible quality of viewing experience, something that couldn’t be guaranteed if videos were delivered from locations outside mainland China. Higher Education institutions are increasingly offering their courses internationally, packaged as a complete overseas programme, and want to be able to reach the Chinese market also. For a paying student base, it is imperative a high-quality viewing experience is delivered, which requires delivery from within mainland China. In practice, it isn’t possible to establish a presence in China without working with a local partner to assist you in gaining the required licence; this can be an unpredictable and lengthy process. Admittedly, it has become smoother in recent years, but the current diplomatic tensions between the US and PRC could change that. We have already been through the difficult and often opaque process of getting approval to deliver content points of presence set up in China and having their connectivity already fully propagated. It’s important to note that not all “global” CDNs are registered and able to deliver content in mainland China. A truly global CDN provider like vzaar has the capacity to not only deliver content beyond the Great Firewall, but also to anywhere in the world. vzaar customers can deliver the same high quality viewing experience to their Chinese viewers as they do to their audiences in other parts of the world. With access to over 60,000 servers across China, we can deliver high-quality video content even to those located away from the populous Eastern seaboard. Bandwidth in China is still very expensive, as much as 50 times more expensive than in western countries. Uniquely, we are able to offer industry-leading prices for in-China playback because of our economies of scale. In-China bandwidth allowances are built into our Launch and Scale plans, and we offer very reasonable overage or expansion options. This makes it a more cost-effective option for businesses. Occasionally in-China playback can throw up different challenges for our customers and they know that our technical experts are working with them immediately to resolve any issues. Watch our ‘Everything You Need To Know About Delivering Videos into China’ Webinar which we hosted with 50Wheel, to see how you can put together a video strategy that reaches your audience in China and what video technology solutions are available. Want to sign up for our 10-day free trial (no credit card required)? Click the button below and start delivering high-quality playback in China today! https://vzaar.com/wp-content/uploads/2018/05/chuttersnap-710335-unsplash.jpg 4016 6016 Rhiannon https://vzaar.com/wp-content/uploads/2019/03/vzdc-logo-1500x630.png Rhiannon2018-05-17 12:35:432019-04-18 21:26:19How Can Businesses Deliver Videos Into China Reliably? Absolutely Bart. We would be happy to set up a call. One of the team will be in touch shortly.